Border Collies, known as the workaholics of the dog world, are a lot of work. They need a job to do, whether its herding, agility, flyball, Frisbee championships ... anything to keep their overactive brains busy! If you don't give a Border Collie the physical and mental exercise he needs, he will destroy everything. These athletic, working dogs are extremely athletic and need hours of exercise each day! They need to run, and they need a purpose. Some well-meaning parents make the mistake of assuming they can just set their Border Collie free in the backyard and that will suffice. You need to challenge your Border Collie. The breed is bred to be challenged! They have a strong herding instinct and they will try to herd anything, including children. While the dog means no harm, it can be frightening to a small child to be herded by a Border Collie, and if the child tries to run away from the scene, the Border Collie might nip at the child's heels or bum. They are not trying to be cruel. They've been bred to be herders. But it still hurts to be nipped. Border Collies are excellent with children, but it takes vigilance on the part of the parents, to make sure both children and dog learn how to interact with each other. Border Collies also try to herd cars, which puts them in danger of being hit. Border Collies do best in a fenced-in yard. But be aware that Border Collies are extremely athletic and can jump over a six foot fence if they decide it's worth the trouble. It is impossible to train the herding out of a Border Collie. These dogs are highly intelligent and will try to over-think everything. They've been called the most intelligent breed in the world. So prospective owners should ask themselves, "Do I want a dog who's smarter than me?" But for the right person, the devoted, passionate Border Collie parent, the breed makes an affectionate and extraordinarily devoted pet. They are sweet and sensitive. They are even known for reading their owner's minds (which could be a good or bad thing). They are not avid barkers, but can be good watchdogs, as they are reserved with strangers and are naturally protective of their family and home. Border Collies love to entertain themselves, which might end up entertaining you. Many of them can become obsessed with a red penlight, a housefly, a ceiling fan, or a siren on television. Border Collies can have hilarious personalities! So, if you want a full-time job, a dog who can turn doorknobs, a psychic friend, a living alarm clock, and you think you can keep up with him (or rather, one step ahead of him), then the Border Collie is for you! 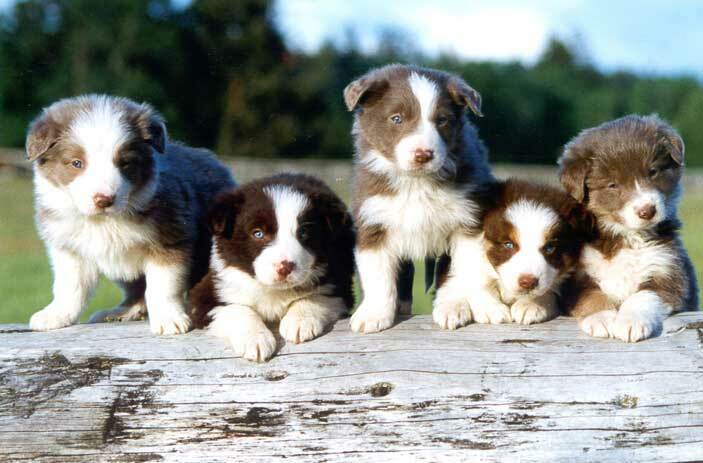 The Border Collie is the most intelligent and easiest to train of all dog breeds! He learns new commands quicker than any other breed, which makes him very easy to train. The medium-length coat of the Border Collie only requires an occasional brushing. But because he sheds you may find yourself brushing him once or twice a week to remove loose hair.